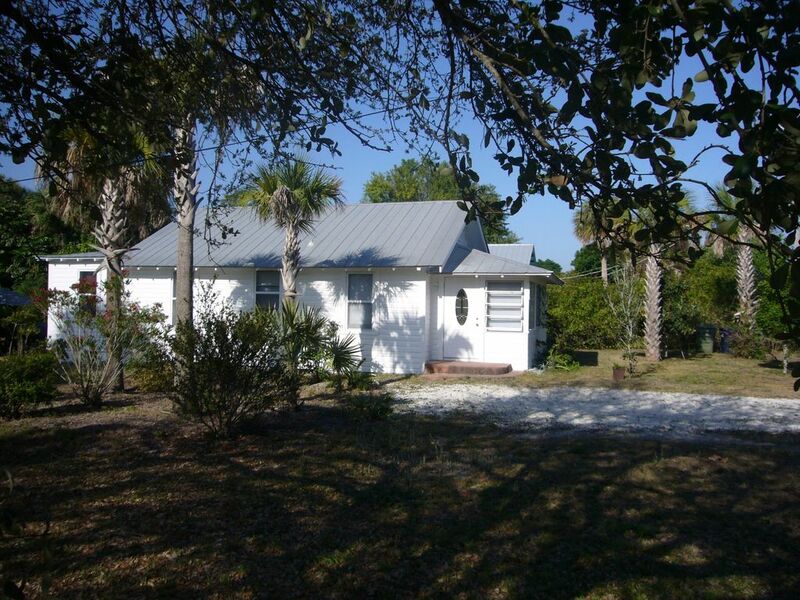 This is a small and simple 1920's cottage just a few blocks from the heart of old downtown Stuart. good places to eat. It is just 10 minutes drive over the St Lucie and Indian River Bridges to Hutchinson Island's beaches. We have updated the kitchen but have kept the old time feeling. The back yard is private and we have a charcol grill and umbrella sitting area. We have central AC/Heat. There is WiFi and cable TV and laundry. We are a couple who live in Maine, Ireland and Florida part of each year. We have a house in Ireland that we also rent. We are both artists. Shelia is a painter of landscapes and Rob is a poet, writer and freelance editor. We love to work in the yard and improve our property. I purchased this cottage in 2005 so I could come down from Maine ech year to paint and draw out of doors. There are many regional parks, rivers and natural areas to visit nearby. Quiet nieghbborhood close to everything one would want. Beautiful nearby beaches and the historic old downtown of Stuart with a boardwalk along the city park on the St Lucie River. Stuart's quaint Old Dowtown is within walking distance with many shops and dining. The River Boardwalk is wonderful and there is a Sunday Famers Market with music events and festivals. you can do everything with in a couple miles with out having to get on US1! We love this! Even the beach! We had a wonderful month at Sheila’s cottage!! I loved her artwork everywhere! Gorgeous colors and subjects!! The bed is very comfortable, although not a traditional queen size. Having new washer/dryer combo was great!!! Loved the renovated kitchen, and the sweet attached patio area overlooking the gorgeous back yard!! I saw raccoon, baby fox, rabbits, a cat, and many birds, big and small!! And the paved seating area with umbrella was especially nice for pre dinner cocktails!! And daytime sitting and reading in the shade!! Towels, beach chairs, sheets, blankets, dishes, cleaning supplies—all in abundance!!! The only thing I’d suggest would be to have one set of new cookware—remove all of the other pieces!! Living room cozy, with very comfortable sofa and chairs. TV fine!! And a bonus for us was that Sheila and Rob were in their back cottage for much of our stay—loved having them there!! Charming cottage, nicely decorated, private, quiet and good location...! Perfect setting for enjoying the feel of authentic Florida. Furnished with many lovely, thoughtful amenities, particularly the artists many distinctive paintings. Note too, the rooms are more spacious than the photos show. A truly pleasurable stay! A sincere thank you to our hosts for sharing. The "cottage" is updated, clean, spacious and comfortable. It's fun to stay in a house like this that has character but doesn't sacrifice the amenities you want in a rental. It sits on an over-sized lot that is well buffered from neighbors providing privacy in both the front and back yards. The neighborhood seemed safe and quiet. We easily walked and jogged to the downtown area and the riverwalk. We liked the new washer/dryer and having it conveniently located in the large bathroom. The bathroom also has a large shower. Shelia fills the rooms with her paintings, which was a special treat. We also happened to be there during Martin County's Open Studio tour, with one of the sites across the street. We felt like we stumbled into the impressive art scene that Stuart offers. Shelia and Bob often stay in another cottage that is on the property and are friendly and helpful. My only suggestion to them was to add a headboard to the bed so you didn't need to lean on the window if you wanted to read in bed. We would definitely stay here again and/or recommend to friends. The cottage was well appointed, very clean, quiet neighborhood and very private. We very much enjoyed our week at the cottage. We especially enjoyed the artwork. The owner was very attentive and delightful to work with. We plan to rent the cottage again. This little cottage harkens back to Florida's early era. Mangroves trees greet you and a coquina driveway leads you right up to a wonderfully maintained example of Florida's early 20th century homes. Extremely clean, all of the modern appliances and counter tops match the early era paneling, wood floors and old fashioned skeleton key door knobs. The owner is an artist and a great many of her works are on display throughout this wonderfully decorated home. The foliage in the back yard provides lots of privacy. Air conditioning, cable TV, full set of towels and dishes, next to downtown Stuart, this place is a no brainer if you're looking for a cozy, relaxing and very private place to stay. One word of caution; beware of the chair with wheels in the dining area, it's can and will eject you without fair warning. The YMCA is close by and accepts visitors. The public beaches are all nearby on Hutchinson Island. Publix Grocery store is on the Island as well.The city park in Stuart's old downtown has a farmers market every Sunday. You can walk or bike to the old downtown from the cottage but ample parking is available everywhere. You can rent bikes locally.